Most TV shows are simple. While they may have convoluted plots or epic arcs, at their base they are pieces of entertainment meant for an audience’s enjoyment. They can be read to have a deeper meaning, but the surface is pleasant enough on its own. 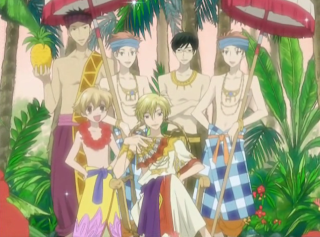 And then you have Ouran High Host Club. It’s…different. Different how, you ask? Well, for starters, it’s a romantic anime that thoroughly plays with and skewers the stereotypes of anime as a whole, while still retaining a relatable and enjoyable storyline. It also plays with things like the female gaze and the roles of male romantic leads, particularly in Japanese culture. But, like I said, it does all of this without getting sentimental or letting the story suffer. And that’s worth looking at. But first off, what is Ouran High Host Club? Well, it’s about a Host Club at Ouran Academy, but I don’t think that answers all that much about it. 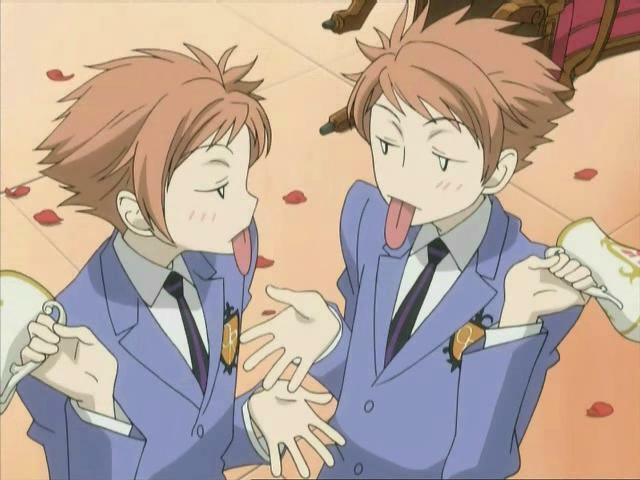 Basically, Ouran Academy is a private school for the children of business moguls and other rich people. The school is so ridiculous that it even has a Host Club, a group of attractive boys who charge the girls at the school for tea parties and other events. It’s like a social club, or a gender reversed traditional Japanese tea house. Each host has his niche market of girls, and most of the girls have their favorite host. It works out well for everyone. 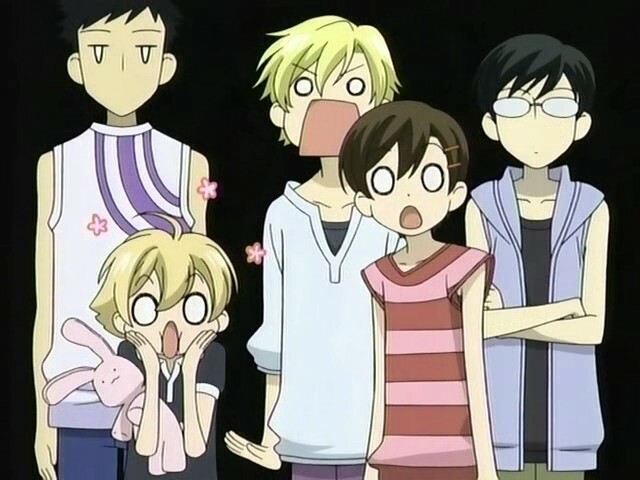 Except for Haruhi, our main character. Haruhi is a scholarship student at Ouran, and discovers the Host Club when she accidentally breaks a very valuable vase they were saving for auction. To work off her debt, they have her work in the club as a host, only slowly realizing that Haruhi is actually a girl. And we’re off. 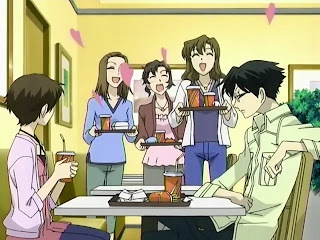 From there it’s pretty much typical wacky hijinks, especially focused on the ridiculous nature of the Host Club and the class differences between Haruhi and her friends. Generally good natured, and more than a little silly, the show could be dismissed as a standard shoujo anime. Well, it could be, if it weren’t the most meta thing I have ever seen, and I include the Deadpool comics in that. The show utilizes a lot of tropes of typical anime, from the voiceover intro to the chibi-style animation when characters are upset, but it uses them in a new way, and it also introduces a few ideas that are pretty specific. The use of cutaways to visual illustrations of the point, or the appearance of fantasies and daydreams, along with the occasional blinking arrow on screen that suggests something important is about to happen, all contribute to the sense of heightened reality. This surrealism is compounded when you realize that the hosts themselves each represent a “type” from typical romantic fiction, and that Haruhi also fills a role, both as a male romantic lead type, and as the “plucky heroine”. What’s funny is, she has no desire to be either. The show comments on this regularly, making note of how Haruhi “isn’t a good heroine” and doesn’t want to be subject of to the tropes of romantic fiction. She’s much more likely to be swayed by the promise of food than she is by the promise of romance, and she persists in believing that what’s on the inside is more important, making her mostly immune to the romantic overtures thrown her way. The show as a whole seems insistent on thwarting the reality of the situation, by having characters comment on the plot as it goes along, setting the story firmly in the female gaze, and making it clear that this is not a typical romance. They even include an audience stand-in, the character Renge, who appears in a serious capacity in one episode, where she tries to remake the club as “bad boys”. In that episode, Renge is mostly reviled by the club for her otaku status (psychotic fangirling), but she reappears throughout the series, always coming out of nowhere to comment on the story. When I say coming out of nowhere, for the record, I really mean out of nowhere. She always appears on a mechanical platform that rises from the floor, even in places where it shouldn’t be logically possible. She always knows exactly what’s going on, without being told, and she has a habit of narrating the action. The setting shifts rapidly, especially at the school, with rooms appearing and disappearing at will, pianos coming out of nowhere, and suddenly opening tropical bird houses, but at no point do these moments go unremarked. Invariably, Haruhi will comment that she’s never seen this or that before, and another student will shrug, or someone will brush it off. What this surrealism does is a serve to let us comment on the tropes of fiction right along with the characters. In making the world heightened and the commentary accessible, they create an atmosphere ripe for analysis. By making all of the characters play stereotypes, they allow the story to go past the stereotype in examining who the characters really are. What I mean is, when you have a character playing a cool guy in the setting of the Host Club, it’s interesting to see what happens when he stops playing the character. In this case, it turns out that he’s a terrifying Mycroft-esque figure. Kyouya’s awesome. I can’t say that I love everything about the show. I mean, the Lobelia Girls are a bad case of Straw Feminists, committed to the rise of women over men and unabashed lesbianism, meant to make the viewer revolt against the idea of an all girls school. But aside from their occasional appearance, and the fact that the show decidedly does not pass the Bechdel Test, it’s a good pick. The reason I appreciate all this surrealism in the show, and the way it gets so strongly meta, isn’t just because I happen to be a sucker for analysis. It’s also because playing with tropes is fun, and shows that play with tropes can be really funny. So even if nothing I’ve listed here about the show appeals to you, try watching it anyway. At the very least, you won’t be bored. All images used are actual screenshots. The show's available on Netflix Instant. Do it. I loved the way Haruhi was actually intelligent, rather than just being a bland idiot like you sometimes see in Shoujo anime. And even though it plays off romance stereotypes, Haruhi doesn't actually end up with any of the boys at the end, because she's already a whole person without them. Such a great message. Agreed. For some reason I couldn't find the word "subversion" when I wrote this, but that's precisely what they're doing. The whole show is about the subversion of stereotypes usually associated with romantic anime. Just watched this on your recommendation. It was surprisingly creepy and good at the same time. Dude, awesome! I'm glad you like it. Though I'll admit, I'm not entirely sure I know what you mean by creepy. I guess I can see that one. The show is so firmly situated in the female gaze that I get that it could be jarring. I can handle the female gaze. It's more the effect of twelfth night to the fifth power. I'm not sure what to do with such a perceptive understanding of fetish. Ah yes. It does get recursively more complicated as the show goes on. Though, I found the metacommentary to be the best part of the show. 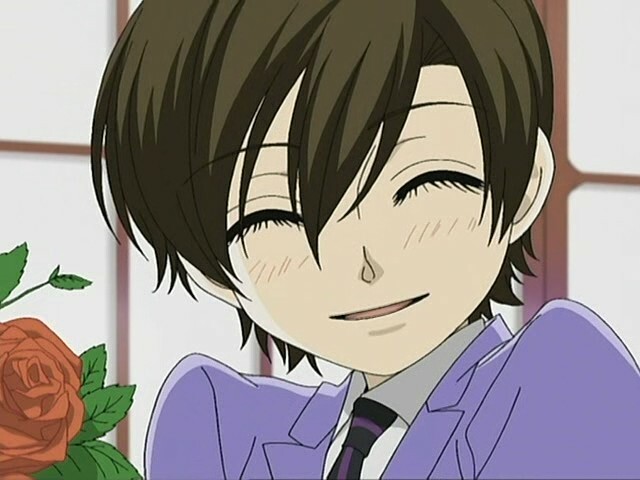 Males generally find Ouran "creepy" because it so blatantly turns the idea of male-dominance in sexuality on its head. It's rated 14+ for a reason and the homosexual innuendo is the least of it. It's the constant undertone of "males as sexual objects" that female fans love and male fans often find scary. Let's face it. All of the Hosts are dysfunctional people until they become the school's idols by catering to feminine fantasies - voluntarily and gleefully without any reason for their willingness to do so other than -- they just do. Looking good, being sweet and accommodating, and fawning over the opposite gender is something women learn to do from the moment they seek Daddy's love while boys are chastised if they're a Mama's-boy. On top of which, the difficult heroine couldn't care less about gender and remains completely unaffected by the attentive, handsome males that surround her. My only issue with your analysis is in casting Kyoya Ootori as a Mycroft-like character? Say what?? A Tsundere character perhaps, but that's about it. Haruhi's perspective gets it right - "I guess even rich people need a day off." Simple stuff here but if you need to over-analyze and toss jargon around, feel free. It's your page. But...c'mon....really? Mycroft-esque -- sheesh. What a way to put a character meant to explode the box *into* a box. Just my opinion.